Traditional Irish fiddler Laurel Martin is known for her subtle, lyrical style that is reminiscent of the regional music of County Clare and East Galway, Ireland. Master fiddler Séamus Connolly was influential in shaping Martin's playing style, as his County Clare roots and dedication to tradition taught her to understand and recreate the bowings, ornaments, and phrasing that made the music of the old masters so distinctive. Between 1990-1993, Martin studied with Connolly under three consecutive Traditional Arts Master Apprentice grants (through Country Roads, Inc.) from the National Endowment for the Arts. Since studying with Connolly, Martin's passion for the old music of the great masters still persists. Her sterling reputation throughout New England distinguishes her both as a performer and a teacher of traditional Irish music. 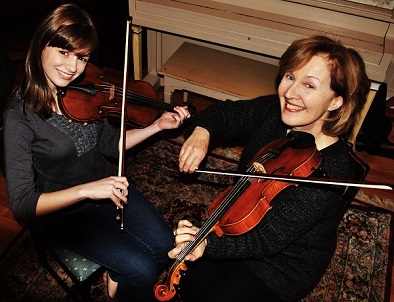 Since 1994, she has served as an instructor of Irish fiddle on the faculty of Boston College's Irish Studies Program. Her latest album, The Groves, was chosen by the Boston Irish Reporter as one of the top ten traditional Irish CDs for 2006. Martin has also collaborated with her mentor Séamus Connolly to publish a book of traditional Irish tunes with two accompanying CDs. Forget Me Not: Fifty Memorable Traditional Irish Tunes was published in 2002 by Mel Bay. In 2002, Martin was the recipient of an MCC Traditional Arts Apprenticeship grant, this time serving as the Master. Her apprentice, Elizabeth "Betsy" Sullivan has always appreciated the great masters that serve as the foundation for traditional Irish music. Despite her young age, Betsy's playing style exhibits what Laurel Martin describes as "a soulful, lonesome sound that is so striking to me when I listen to the old players". In the Fall of 2010, Laurel was awarded another apprenticeship, this time to work with Natalya Trudeau. They will concentrate on the repertoire of six 20th century composers: Paddy Fahey, Ed Reavy, Paddy O'Brien, Sean Ryan, Junior Crehan, and Charlie Lennon.